Mark began his career as a trainee with Manchester City, but failed to make a first team appearance. After his release, he spent a season with Norwich City, but again was unable to break into the first team. In August 1993, he moved to Peterborough United where he played some 19 games before moving to Mansfield Town the following summer. 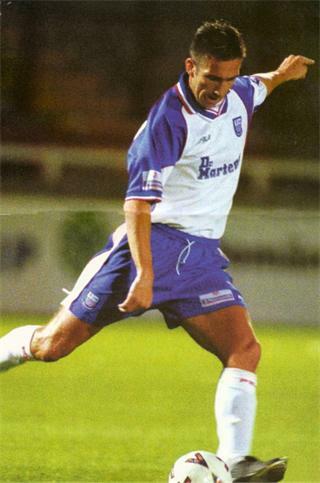 He played over 100 times for the Stags during a five year stay, before signing for Diamonds on 24 May 1999. He quickly became a popular figure at Nene Park, playing in the central defender role, and helped Diamonds to the Conference title in May 2001. He progressed with the side into the Football League, played a part in most games until he lost his place in the side in February 2003 after a run of poor results. The arrival of Andy Edwards meant that he played no further part the Championship winning campaign that year. Although he was contracted to the club until the summer of 2004, he was released by mutual consent on 11 September 2003, and joined Leyton Orient. Although he played throughout his first season at Brisbane Road, he had difficulty making the first team the following season, and went out on loan to Aldershot Town in November 2004. A foot injury meant his enforced return to Orient, and some six months out of football. He was released at the end of the season and joined Cambridge United in August 2005, combining playing and coaching for the U’s. He made almost 100 appearances for Cambridge in three years, before moving to Kings Lynn in July 2008 for the season. In July 2009, he joined Conference South side St.Albans City as player / assistant manager / youth team coach. Following retirement from the playing side, Mark became coach of the newly formed Corby Town Under 19 side, becoming Head of Youth, and assistant to Chris Plummer following his appointment as manager in September 2012. Following Plummer’s departure on 20 August 2013, Mark became interim manager the following day, but reverted back to his role as Head of Youth on 9 September 2012 after the appointments of Andrew Wilson and Tommy Wright as joint Managers. He joined Mansfield Town as Head of Academy Coaching in June 2015.